Are we at war in Yemen? 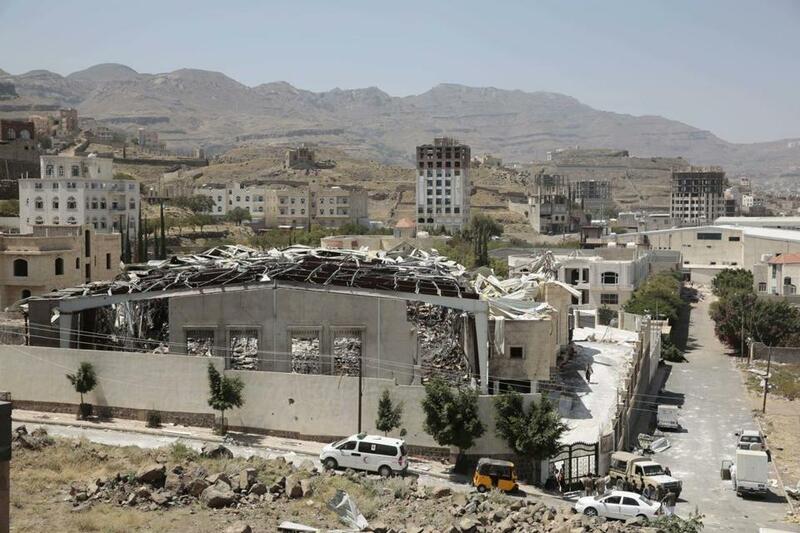 A funeral hall was destroyed in a Saudi-led airstrike in Sanaa, Yemen. For over a year, the United States has played a key, supportive role in the war in Yemen, providing weapons and logistical support for the Saudi Arabia-led bombing campaign. But Thursday, we stepped into the foreground, launching cruise missiles against Saudi Arabia’s opponents, the Houthi rebels who control the capital city and who recently started taking aim at US warships. It’s the latest development in a dire but often overlooked conflict that has killed thousands, displaced millions, and threatens to become the next Syria-level disaster. Here’s what you need to know. ■ Houthi rebels. The Houthi are an insurgent group who follow an offshoot of Shia Islam. In 2014, Houthi militias seized the Yemeni capital of Sana, dissolving the parliament and forcing the president to flee the country. For over a year now, they’ve been subject to intense aerial bombardment from the Saudis and allies. But they remain in control of the northwestern part of the country. The Houthis have benefited from an alliance with Yemen’s former president Ali Abdullah Saleh, a onetime strongman who still garners loyalty from the military. They also seem to have received some limited support from Iran, but nothing like the direct mobilization that aids groups like Hezbollah in Lebanon or government forces in Syria. ■ Saudi Arabia. Lined up against the Houthi is the region’s leading Sunni power, Saudi Arabia. The kingdom not only shares a long border with Yemen but has a long history of involvement with the country. It has assembled a coalition of mostly Sunni states to fight the Houthi and restore a more Saudi-friendly government. ■ The United States. From the beginning, there’s been no question about where the United States stands: with the Saudis. We’re selling them bombs to drop on Yemen, helping to refuel Saudi warplanes, and providing other logistical support. At the same time, the United States is also involved on another front, directly targeting ISIS and Al Qaeda groups inside Yemen. ■ Al Qaeda and ISIS. The branch of Al Qaeda that operates in Yemen, AQAP, is considered one of the most dangerous. To date, it doesn’t seem to be playing a pivotal role in the Yemen war, but that could change. Saudi-led bombing raids have intensified in recent weeks, following the breakdown of peace talks in early August. One tragic result has been a series of civilian catastrophes, including the bombing of a school, a hospital, and funeral hall. All told, the conflict has cost thousands of civilian lives and forced millions of people from their homes and communities. These tragedies have drawn new attention to the Yemen conflict, and raised questions about the US role. Chief among them, why does the United States continue to assist the Saudis, when their bombing campaign has done so much damage and so little strategic good? Until now, the United States has mostly managed to evade criticism by keeping its involvement out of view. That may change with the news that US destroyers fired on Houthi targets Thursday, potentially marking a new phase of direct conflict between the United States and the rebels. But with President Obama counting down his days as commander in chief, any major shift in approach may have to wait for January. At that point, a new president will decide the future of America’s role in Yemen. Neither Hillary Clinton nor Donald Trump has discussed plans for the country, but whoever wins the Oval Office will face a choice: withdraw support for Saudi Arabia in order to force all parties back toward the negotiating table or expand US involvement to help bring a military end to this long battle. Evan Horowitz digs through data to find information that illuminates the policy issues facing Massachusetts and the United States. He can be reached at evan.horowitz@globe.com. Follow him on Twitter @GlobeHorowitz.